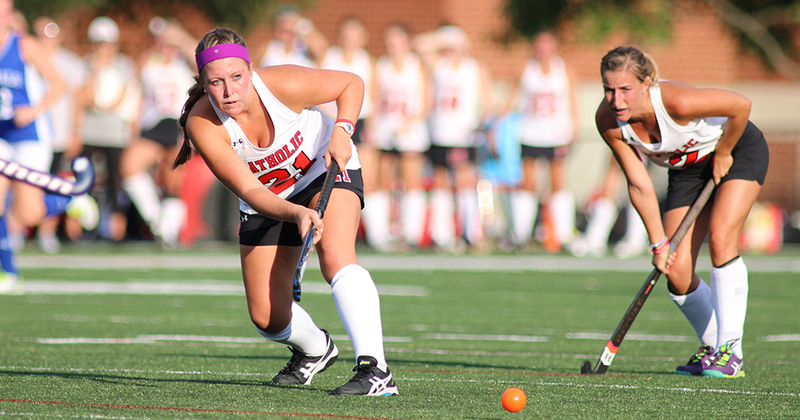 The field hockey team at Catholic University picked up a crucial victory against the Gophers of Goucher College in their Wednesday, October 12th match. The Cardinals shut out Goucher 1-0 in the win that brought Catholic’s record to 3-1 in the Landmark Conference, and 7-4 overall. This key victory in the tight match up brought the Cardinals one step closer to their quest for an 8th straight appearance in the Landmark Conference playoffs, and a chance to make a 6th straight appearance in the NCAA tournament. The 1st half of the game was evenly matched and a hard fought battle with neither team gaining a clear advantage over the other. Both teams took four shots in the half, and maintained an even time of possession in the 35-minute-long period. Both teams did come dangerously close to taking the lead with multiple Cardinal shots making their way behind the goalie, and the Gophers managing a couple of breakaways that were shut down by the steadfast defense of senior goaltender Analisa Scott. Scott managed to continue her dominance in goal as she added 3 more saves to her career total 224 saves. Her performance also gave the senior her 11th career shutout, and her second on the season. This victory was the senior’s 35th career and her 4th on the season. The entirety of the Cardinal defense was needed to perform as the Gophers had 10 total penalty corners in the match, 4 more than Catholic. The second half was just as gritty and evenly matched as the first, with both teams boasting similar stats and steadfast defenses to keep the match even. The stalemate wasn’t broken until a Catholic penalty corner deep in the half. The assist came off of the stick of forward Rachel Baca, who sent the ball to junior Kelly Cousoulis who rocketed a shot from the top of the circle for her first career goal. The Cards 1-0 shutout over Goucher sets Catholic in a tie for 2nd in the Landmark Conference, only one game behind the Blue Jays of Elizabethtown College who dealt CUA their only conference loss. The team’s journey back to the playoffs and the NCAA tournament will not be an easy one with 5 more regular season games against a strong schedule filled with playoff caliber teams. The Cardinals return to action Saturday, October 15th during Cardinal Weekend against the Moravian College Greyhounds.